Clara Louise Maass was born on June 28, 1876 in East Orange, New Jersey, the oldest of nine children. She entered the Christina Trefz Training School for Nurses at Newark German Hospital and completed the two year program in 1895 at age nineteen. After working as a private duty nurse and then a head nurse at that hospital, she volunteered as a contract nurse for the Army during the Spanish American War. 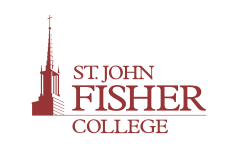 She served in Jacksonville, Florida, Savannah, Georgia and Santiago, Cuba. Like many other contract nurses she provided care for the large numbers of soldiers with malaria, typhoid fever, and dysentery until her discharge in February 1899. In November 1899 she again responded to a call for contract nurses. She was sent to the Philippines to care for soldiers with smallpox, typhoid and yellow fever. During the Spanish American War more soldiers had died of yellow fever than were killed from battle. Efforts were underway to determine the cause of yellow fever, and in the fall of 1900, Dr William Gorgas, Havanna Sanitary officer, sent out a call for volunteer nurses. Knowing first hand of the devastation caused by yellow fever, Miss Maass once again volunteered to serve in October 1900. She further volunteered to be bitten by a mosquito and in June 1901 contracted a very mild form of the illness, from which she quickly recovered. The physicians did not believe that she could have become immunized by such a mild attack and she agreed to be bitten again on August 14. This second case was virulent and she died on August 24, 1901 at the age of twenty-five. No further experiments were conducted. Initially Miss Maass was buried in Havana but the US Army moved her body to Fairmount Cemetery in Newark, where the grave was marked with a simple Army stone similar to the one below. The story of Miss Maass would be buried in obscurity if it were not for the efforts of Leopoldine Guinther, a Superintendent of Newark Memorial (formerly German) Hospital. It was Miss Guinther, stimulated by a portrait of Miss Maass, who brought her sacrifice to the forefront. The pink granite gravestone with the bronze plaque (pictured at the top of the page) was erected to replace the plain stone marker, and in 1952 Newark German Hospital was re-named the Clara Maass Memorial Hospital, which has since moved to Belleville, NJ. Cuba issued a postal stamp honoring Miss Maass in August, 1951 on the fiftieth anniversary of her death. In 1976, the 100th anniversary of her birth, the United States Postal Service issued a commemorative stamp honoring Miss Maass. Cunningham, J.T. (1968). Clara Maass: A nurse, a hospital a spirit. Cedar Grove, NJ: Rae. Guinther, L. (1932, February). A nurse among the heroes of the yellow-fever conquest. American Journal of Nursing 32 >(2) 173-176. Knollmueller, R.N. (1985). Historical perspective: Clara Louise Maass Public Health Nursing, 2(3): 178-9. Herrmann, E.K. (1985). 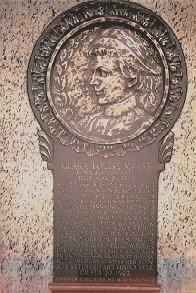 Clara Louise Maass: heroine or martyr of public health? Public Health Nursing 2(1): 51-7. Samson, J. (1990). 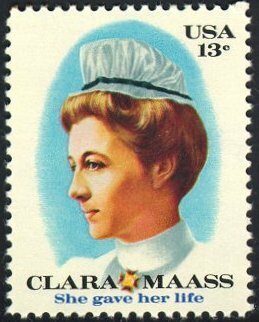 A nurse who gave her life so that others could live: Clara Maass Imprint 37(2): 81-2, 84, 87 et passim.